This time around (get it? Puns!) we look at the Neo-Pagan wheel of the year. We also discuss the importance of cycles in magical and spiritual practice, and we announce our latest contest winner. Producers for this show: Corvus, Diana Garino, Renee Odders, Ye Olde Magic Shoppe, Raven Dark Moon, Ivory, The Witches View Podcast, Sarah, Molly, Corvus, Catherine, AthenaBeth, Jen Rue of Rue & Hyssop, and Jessica (if we missed you this episode, we’ll make sure you’re in the next one!). Big thanks to everyone supporting us! For our “Looking Back” segment, we turned to Episode 44 – American Holidays for our inspiration. We’d also like to mention Jason Mankey’s article “The Eight Great American Sabbats,” which prompted that discussion originally and influenced this one somewhat. Laine mentions she’ll be trying an upcoming WitchBox to see if it sparks her practice a bit. You can read a lot about the history of the Neo-Pagan holidays in Margaret Atwood Margot Adler’s Drawing Down the Moon, Aidan Kelley’s A Tapestry of Witches, and Ronald Hutton’s Stations of the Sun. We’ll be attempting a live broadcast via Periscope in late June, so stay tuned for details on that! Also, we should be launching our newest podcast effort, Chasing Foxfire, in the next few months as well. Additional music is “Happy at the Wheel,” by The Twin Atlas, found at the Free Music Archive and used under a Creative Commons License. In this episode, we look at witch gatherings under full moons and around bonfires, from tales in folklore to what we do when we get together with other witches. Producers for this show: Corvus, Diana Garino, Renee Odders, Ye Olde Magic Shoppe, Raven Dark Moon, Ivory, The Witches View Podcast, Sarah, Molly, Corvus, Catherine, AthenaBeth, Jen Rue of Rue & Hyssop, and our newest Producer, Jessica (if we missed you this episode, we’ll make sure you’re in the next one!). Big thanks to everyone supporting us! CONTEST ANNOUNCEMENT! It’s the last month to enter! We want to do a second round of our Audio Spellbook, so all you have to do is send us the sound of *you* describing your favorite spell which uses everyday ingredients (things you could find in a spice cabinet, grocery store, or backyard, for example). You can either record your spell and email it to us at compassandkey@gmail.com or call us and leave us a voice mail on our official NWW hotline: (442) 999-4824 (that’s 442-99-WITCH, if it helps). You can also get an extra entry by sharing either our Patreon page or our Contest Announcement via your favorite social media (make sure to tag us or get a screen capture you can email to us). What will you be entered to get? Well, you’ll get a NWW Annual Mailer (who can’t use an extra one of those, right? ), a couple of bottles of our personally handmade condition oils, a folk charm or two, and a book or two to make it all even better! Our “Looking Back” segment is Episode 43 – Solitary, Partner, or Coven. You may also want to check out our Special Episode – The Horned Women, which features a fairy tale version of a witch gathering. You may also want to check out Sarah Lawless’ episode on Sabbats from her old show, Hedgefolk Tales, which has an account by Robert Cochrane on it. 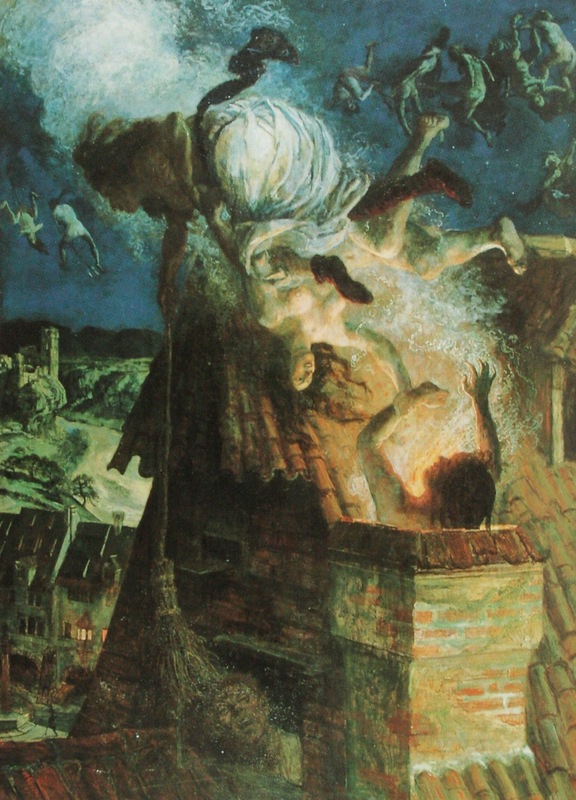 A caveat before I begin today’s post: Walpurgisnacht is not terribly “New World.” Most of it will be related to the British Isles and Europe, though I will include a little bit on New World practices, too. But I think it’s still relevant to witchery, so I’m going to write about it anyway. Mostly because, well, I really want to. What shifted the focus from holy martyrdom and sainthood to witch-filled revels? Well, there’s no single reason why that I’ve found, but the date is directly opposite Halloween in the calendar year, so that might have something to do with it (what, you thought witches would be content with one night of fun a year?). My personal practice incorporates a storytelling bent, and there’s one story that I turn to every year as part of my Walpurgisnacht ritual. “The Horned Women,” as recorded by Lady Wilde (in a collection with many tales also recorded by W.B. Yeats which I’ve mentioned before—Fairy & Folk Tales of the Irish Peasantry), is not explicitly about this wild night. Yet certain elements—the assembly of a coven of witches, and the prominent mention of a mountain where they revel, especially—have always called to mind this tale in relation to May Eve. I glean much in the way of magic from this story, and incorporate things from it into my workings (such as the use of “feet water” to guide all harmful forces away from my home). Walpurgisnacht doesn’t register on everyone’s radar. Some are definitely drawn towards the Beltane side of this holiday, and I rather love that celebration, too. But Walpurgisnacht will always have a special place in my heart. There’s no night I more earnestly wish I could climb on a broomstick and sail off into a moonlit sky than this one.